NBC exec Jeff Gaspin could use about a dozen "30 Rocks" right now to stem a dam burst of news and rumor that will consume him for many weeks to come. Just think: NBC was trying to get out of the drama business. Instead, the network's failed 10 p.m. experiment, “The Jay Leno Show,” has created nothing but drama, the kind they were trying to avoid. With “The Jay Leno Show” getting the axe right before the Olympics, NBC is left with a huge, nightly, prime-time hole to fill. The Peacock Network has also damaged a key part of their schedule, put late-night television up for grabs, and alienated the one guy for which they opened up this whole Pandora’s box for — Conan O’Brien. Just how much drama was going on behind the scenes in late-night TV came to light with NBC chairman Jeff Gaspin’s frank disclosures Sunday at the TV critics' winter press tour in Los Angeles. Yes, “The Jay Leno Show” was toast at 10 p.m.. 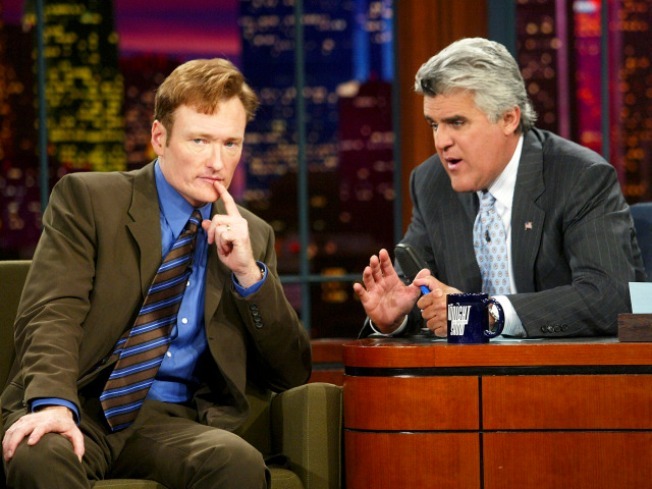 Yes, NBC has offered Leno a half-hour series to run weeknights at 11:35. Yes, under Gaspin’s plan, O’Brien will keep “The Tonight Show,” although it moves back, behind Leno, and starts at 12:05 each night. Yes, Jimmy Fallon would get pushed back, too, with his “Late Night” getting a 1:05 a.m. slot. The three hosts were taking the weekend to think about it, said Gaspin. “As much as I’d like to tell you that’s a done deal, we know that’s not true,” he told critics. One of the players seems to have come to a decision. “I think so,” was Leno’s response to a Canadian newspaper reporter Saturday when asked if he was returning to 11:35. None of the three NBC hosts were at press tour this weekend. The one with the hardest decision, most critics agree, is O’Brien. He gave five years of his life and uprooted his family and crew from New York to Los Angeles with the promise that he would finally land his dream job hosting “The Tonight Show.” Now, four months into the season, he is being asked to follow Leno once again. There is a great deal of speculation that O’Brien’s contract calls for NBC to pay him a multi-million-dollar penalty if they remove him as “Tonight Show” host. Gaspin’s proposal allows NBC to stick to the letter of that agreement if not quite the spirit. O’Brien, however, may decide that the offer he walked away from five years ago — to ditch NBC for Fox or some other broadcaster — may be in his best interests this time. Gaspin, who refused to comment on contracts or other specifics until a deal is in place, repeated during and after the session that O’Brien, as well as Leno and Fallon, have been nothing other than “incredibly gracious and professional” throughout the negotiations. He feels his deal gives all three what they essentially want. Leno cares most about telling jokes at 11:35. O’Brien wants to host “The Tonight Show.” The 1:05 start, Gaspin suggests, will allow Fallon “to be incredibly experimental and do what he wants to do and have a lot less pressure,” he said. Still, the plan was not to bail on "Leno" until September. Gaspin admits it was the threat of an affiliate revolt that forced him to deal with these changes now. NBC`s network business plan to cut costs by trading pricey dramas for cost-efficient talk-comedy worked, he insisted. Ad sales were good on all shows involved and NBC made money. The affiliates, however, lost money. Lots of it. He calculated that about a third of NBC’s 200-plus station affiliates were threatening to ditch “The Jay Leno Show” after the Olympics. The 10 p.m. series simply was not delivering the ratings the affiliates were used to seeing for their 11 p.m. local newscasts. The biggest miscalculation, Gaspin feels, may have been how quickly viewing habits have changed. NBC figured they would lose some viewers at 10 p.m. with "Leno" instead of dramas like "Law & Order: SVU," but still come second or at worst, third in the timeslot. The unseen variable was how many viewers migrated not to CBS or ABC (both down slightly in the fall, Gaspin claims), but to cable and especially to DVR and TiVo use. Suddenly, viewers who may have missed "House" or "Vampire Diaries" or couldn't stay up for "Jimmy Kimmel" or "Fallon" were watching them over the next day or two at 10 p.m.
Gaspin had many conversations with his boss, NBC Universal chairman Jeff Zucker, who had signed off on the "Leno" changes and who, according to Gaspin, was loath to throw in the towel. Gaspin insisted that Comcast’s pending deal to buy NBC Universal from GE has “absolutely nothing” to do with the scheduling shakeup. Approval of that deal could be another year-and-a-half, Gaspin pointed out. He had to act now. On Friday’s NBC talk shows, all three hosts joked about the pending shakeup, with O’Brien’s digs having the most sting and bite. “NBC is going to throw Jay and me in a pit with sharp sticks,” he said during the monologue. “The one who comes out alive gets to leave NBC. Gaspin says he saw Friday`s monologues and has no problem with the jokes at his network`s expense. "If that’s how they want to blow off steam, if that’s how they’re comfortable, I am perfectly fine with that," he says. "We have a show, "30 Rock," which mocks NBC and GE on a regular basis. It's one of my favorite shows on TV." Gaspin could use about a dozen "30 Rocks" right now to stem a dam burst of news and rumor that will consume him for many weeks to come. Bill Brioux’s “Night Watch: 50 Years of Late Night Television,” is due out this year from Praeger Press.